Last August, the Brooklyn Bridge Park Corporation (BBPC) unveiled 14 proposed designs for a pair of controversial towers it planned to build near the park’s southern-most pier. Under a Bloomberg-era development plan, sites along the park would be leased to private developers to finance the upkeep of Michael Van Valkenburgh‘s 85-acre green space. 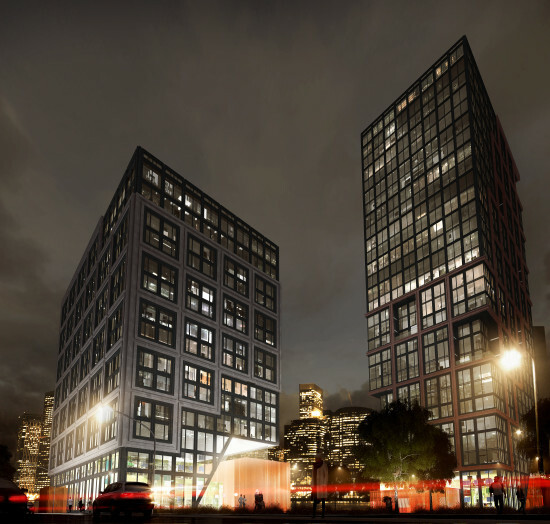 These two towers near Pier 6 represented the last piece of the development puzzle. Proposals for the two sites came from some of architecture’s heavy hitters like Bjarke Ingels, Morris Adjmi, Pelli Clarke Pelli, and Selldorf Architects. But now, nearly a year later, the BBPC has picked a design for the project by a firm not included in that original group: ODA Architecture. Unsurprisingly, the firm is sticking with its boxy aesthetic for its Pier 6 design. 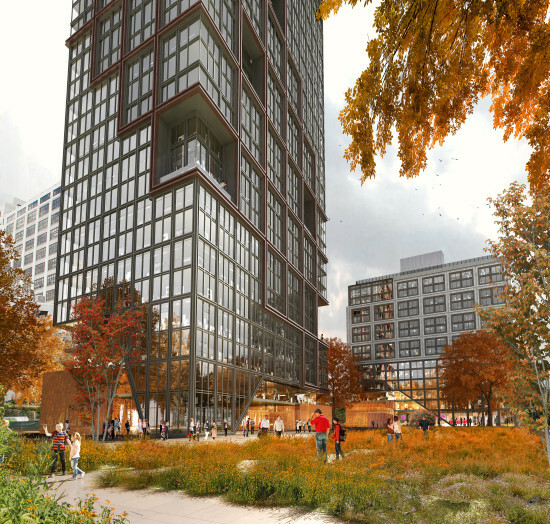 The taller of the two structures, containing 192 market-rate condos, rises to 285 feet. It features factory-style windows and triple-height cutouts punched into its facade. The smaller building tops out at 125 feet and has a mix of market-rate and affordable units, as well as a 75-seat pre-kindergarten. The height of both buildings has been lowered by 30 feet in response to public outcry over their size. Their size, though, has been just one of the controversies surrounding this development. A local group called People for Green Space sued to stop the plan after Mayor Bill de Blasio pushed to increase the percentage of affordable units within the project to 30 percent. The group argued that the inclusion of affordable housing went against the original funding scheme, and thus required an additional environmental review an amendment to the decade-old General Park Plan. People for Green Space and the BBPC settled this spring. At the time, the New York Times reported “the group was denied the environmental review, but it prevailed in its demand that the park corporation formally amend its plan.” The agreement cleared the path for the project to move forward. It is being developed by RAL Development Services (RAL) and Oliver’s Realty Group. If the plan is approved by the Brooklyn Bridge Park Board of Directors, construction would start next spring and wrap up in Fall 2017.